In many ways, marketing automation is the only trend that matters in the industry this year. After years of talking about big data, personalisation and cross-channel marketing, automation is finally making all of these things possible and the best part is it makes them accessible to businesses of all sizes. Thanks to automation, big data doesn’t require the programming experts or data scientists it once did and even the smallest brands can now turn large amounts data into more effective business decisions. If you’re not already automating as much of your sales and marketing workflows as possible, you’re probably not maximising results. And, with this in mind, here are five top tools that to systemise your sales and marketing strategies. Features are one thing but actually using them to transform your marketing results is something else entirely – so let’s look at how ApproveMe.com uses ActiveCampaign to boost its profits by 1,600%. That may sound like a made-up number but it comes from ApproveMe itself and you can read the company’s case study on the ActiveCampaign website. Before launching, ApproveMe built and optimised a website asking people to sign up and test a pre-release version of its product. This gave the company a chance to tests and improve its product before fully releasing it but it also helped build the company’s first email list which it could use to convert testers into buyers. Using ActiveCampaign, ApproveMe was able to build a list of more than 1,000 testers and potential customers before it had even launched (not to mention getting invaluable feedback on how to improve its product). 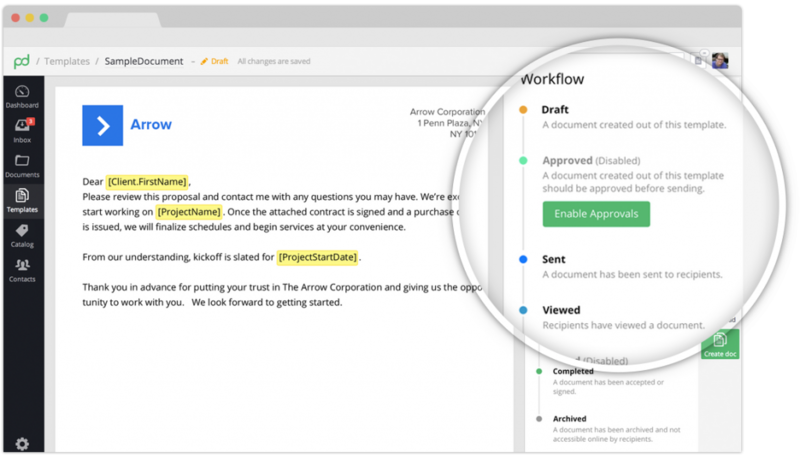 As soon as someone signs up to test the demo, ApproveMe’s automated workflow begins and guides users through the sales process, ultimately asking them to buy in to the product for real. 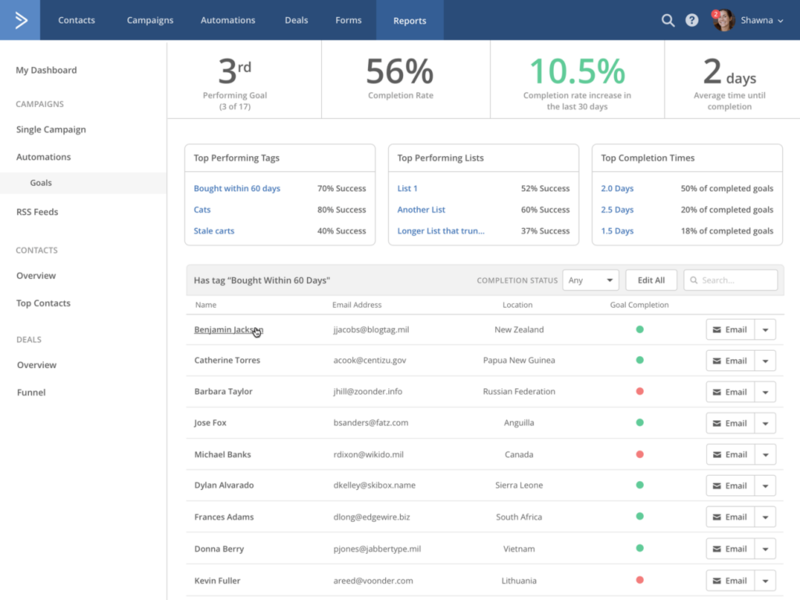 Using ActiveCampaign’s site tracking feature, ApproveMe can see what users are getting up to on its website and send custom messages based on their actions. 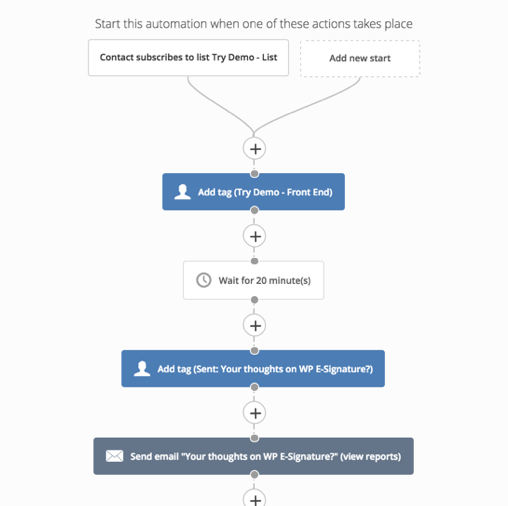 Each user action identified by ApproveMe triggers one of four different email responses, calling on them to take the next step. All of this happens in the background without ApproveMe’s marketing or sales teams doing anything. For example, when ActiveCampaign detects that a contact has visited ApproveMe’s website twice within a short time frame, it sends out a message asking them if they have any questions about the product. Instead of starting out with zero leads on launch day, ApproveMe was proactive in building an audience with purchase potential before its product even went live. With ActiveCampaign powering its marketing smarts, the company says it was able to boost profits by 1,600% and gain invaluable customer insights at the same time. HubSpot is one of the leading names in marketing and sales automation. It offers three separates software packages: a free CRM as well as its Marketing Hub and Sales Hub. You can use each product independently or combine them to create a full suite of marketing, sales and CRM tools. I-Vitae provides diagnostic testing for women with unexplained infertility, hoping to find out potential causes and give them a chance to conceive naturally. When the company changed its business model from B2B to B2C, it needed to reach an entirely different target audience quickly and it turned to HubSpot to help make it happen. In four months, I-Vitae was able to increase leads by 43x, email open rates to 62% and boost blog engagement by 300%. More importantly, 9% of all visitors to I-Vitae’s website now convert into fully qualified leads. You can read the full case study over at HubSpot but let’s summarise how the Italian startup pulled it off. First, the company put its entire site on the Hubspot CMS and set up a complete conversion funnel for its new B2C target audience. Next, it ran A/B tests on the call to action on its homepage and different sales funnels to choose the most effective conversion process for its customers. With HubSpot CRM, I-Vitae builds a contact profile for each lead, allowing its sales team to reach out via Sales Hub with targeted messages and interactions, encouraging prospects to take the next step along the sales funnel. Leadformly is a multi-step form design and optimisation tool that helps you increase leads and conversion rates on your website. Meanwhile, Bidsketch allows you to automate proposals and bids for new prospective clients. Both of these are great platforms in their own right but they become an automation powertool when you implement them both together. 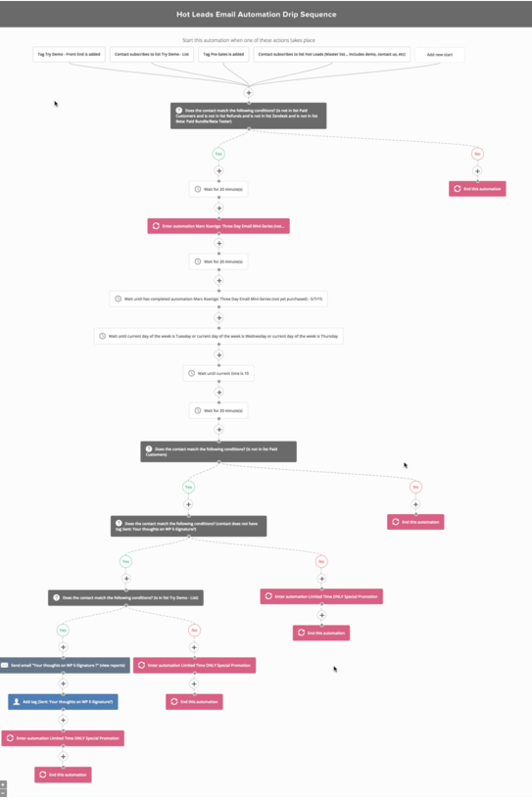 As we mentioned in a recent article looking at how to automate quotes and proposals, you can use webhooks to sync your Leadformly leads with Bidsketch and send out customised proposals to different types of customer, based on how they interact with your forms. Using Leadformly’s conditional logic features, you can segment leads while they’re completing your form and build an accurate picture of what they need from you. From here you can create targeted proposals for each type of lead your forms are going to generate and Bidsketch will automatically send them out to the relevant lead without you needing to do anything. This saves you manually drafting proposals for every lead, segmenting your contact lists from scratch and wasting time with leads that don’t materialise. You can also integrate this system with CMR platforms like Salesforce and Infusionsoft to automate follow-up interactions and the rest of your lead nurturing strategy. 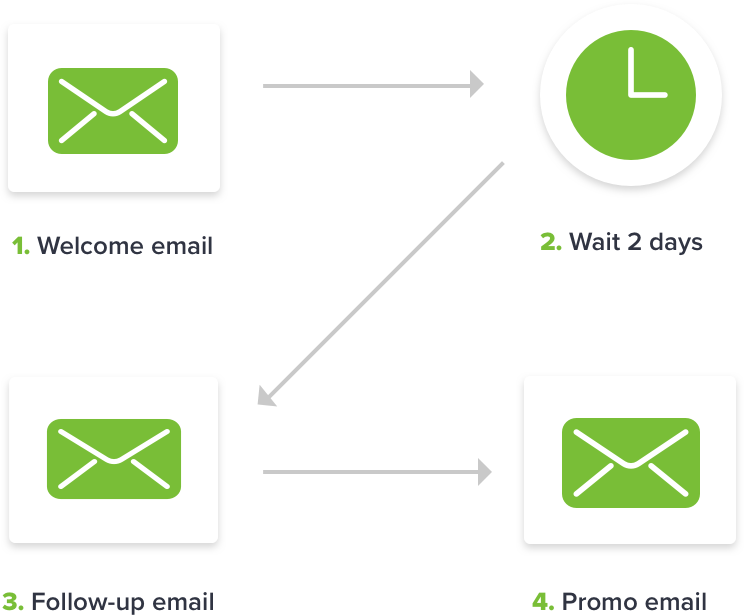 Infusionsoft is a complete sales and marketing automation system for businesses of all size. Platforms like this tend to be associated with digital and online brands but Infusionsoft has helped thousands of “offline” businesses grow in an age where every company need to take control of their digital presence. When Cleancorp first started out in Australia in 1995, digital marketing as we know barely even existed but the company adapted and capitalised on the web revolution. It wasn’t easy, though. In fact, after initial success, Cleancorp ran into problems with the sales and admin side of the business. In terms of the service it was providing, there were no complaints but scaling the business in a manageable way was proving incredibly difficult. In 2007, Cleancorp turned to Infusionsoft and within 18 months the company had expanded nationally. Dramatic growth boosted revenue by 275% and increased the company’s customer lifetime value by 145% turning Cleancrop into a multimillion-dollar brand. So how did it do this? With Infusionsoft, Cleancorp has been able to create a personal experience that starts online and works its way through to the offline experience of enjoying its services. Customers are greeted with personalised greeting emails introducing them to the leaning professional who will serve their business and the company’s support team has all the info they need to hand when a customer calls with a query. Founders Lisa and Hamish Macqueen say Infusionsoft has reduced their working week from 50 hours to 32 hours while boosting their revenue by275% at the same time. Blueshift is a cross-channel marketing platform that uses artificial intelligence to help you understand leads more effectively and convert the into customers. 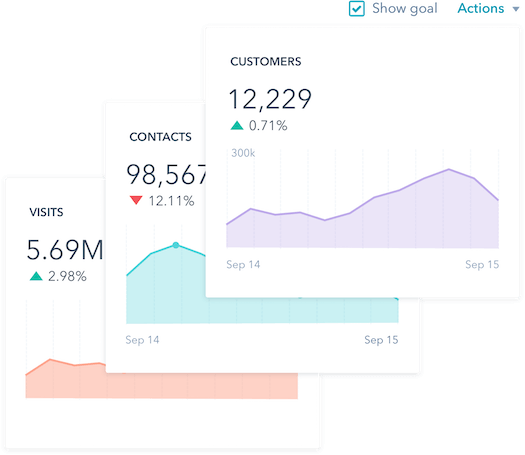 Blueshift builds consumer journeys across each of your marketing channels, based on data collected from your existing leads and customers, allowing you to apply these insights to new leads. It also automates audience segmentation based on their real-time behaviour, allowing you to send tailored messages to people as their position along the consumer journey changes via email, push notifications and SMS. Vouchercloud is the UK’s biggest money-saving app and the company was able to boost its revenue by another 81% within six months of using Blueshift. Vouchercloud used Blueshift to deliver more than 1 billion personalised messages, triggered by user behaviour across multiple channels. Segment and target customers: Segmenting and targeting users based on user actions – eg: favouriting a retailer or redeeming an app offer at a specific location. Personalisation: Personalising messages based on user behaviour to address their needs as they change. Unify data from multiple platforms: Create single user profiles as users move between the Vouchercloud website, mobile app and other channels. Manage leads in one place: Blueshift allows Voucherclouds small marketing team to manage all leads from a single platform. Manage large campaigns: Events like Black Friday and Christmas can be demanding but Blueshift makes it possible for Vouchercloud’s team to manage campaigns for the biggest calendar events. This strategy boosted open rates for Vouchercloud’s messages to 40% – more than 3x the previous rate for batch communications and boosted revenue by 81% in six months. All of which happened with a relatively simple automation strategy that works in the background while Vouchercloud concentrates on building a bigger brand. The biggest differentiator between brands over the next few years is going to be their ability to automate as many tasks as possible to free up resources for those that can’t be handled by algorithms. As for the losers, these will be the companies, marketing divisions and sales teams that are slow to adopt automation and waste time on inefficient workflows. Make sure you’re not the latter.